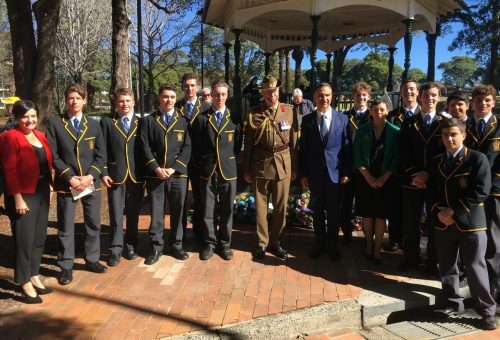 On Sunday 5 August, thirteen Year 11 students accompanied by Mr Newman attended a war memorial service to pay respects to the Australian soldiers who were taken prisoner in Sandakan, Borneo during World War II. Approximately 2,000 soldiers were taken as prisoners of war to Sandakan in Borneo where they experienced torture and unimaginable living conditions until the very end of the war. It was at this point that those who had survived were forced to undertake a 9-day trek, spanning over 200kms across the top of Borneo. Only 6 soldiers survived this journey hence their name; ‘Death Marches’. Twenty three of these soldiers were from the Burwood area, the service is appropriately held at the site of the Sandakan War monument in the middle of Burwood Park. During the service we heard from a number of dignitaries including the Mayor of Burwood (and SPC parent) John Faker, Jodi McKay (Member for Strathfield) and Colonel Michael Miller (Official Secretary to the Governor of NSW). We were also treated to some touching poetry written by prisoners of war and their families. One student summed up the impact the service had on him: “The service was an eye-opening experience and I learnt a lot about the tragedies of war. I am grateful for the opportunity to attend”.